Wanneer mensen 4 dagen een zalf smeren met calcipotriol plus 5-fluorouracil (5-FU) op hun gezicht en hoofd dan blijkt deze zalf AK = actinische keratosis te voorkomen. Na 3 jaar had maar 7 procent van de deelnemers die de zalf hadden gebruikt nieuwe plekken van actinische keratosis (AK) tegenover 28 procent van de mensen die een zalf met vaseline plus 5-FU hadden gehad. Een actinische keratose is een beschadiging van de huid door zonlicht. Het zijn meestal kleine, iets verdikte plekjes van de huid, die ruw aanvoelen. Deze keratose-plekjes ontstaan op delen van je lichaam die vaak in de zon zijn geweest, zoals je gezicht of de bovenkant van je handen. De studie werd uitgevoerd in Sydney - Australië waar actinische keratose veel voorkomt door de sterke zon. Het volledige studierapport: Skin cancer precursor immunotherapy for squamous cell carcinoma prevention is gratis in te zien. BACKGROUND. Topical calcipotriol plus 5-fluorouracil (5-FU) combination is an effective immunotherapy against actinic keratosis (AK), which is a precursor to squamous cell carcinoma (SCC). However, the long-term effectiveness of calcipotriol plus 5-FU treatment for SCC prevention is unknown. METHODS. We performed a blinded prospective cohort study on participants of a randomized double-blind clinical trial in which a 4-day course of topical calcipotriol plus 5-FU combination was compared to Vaseline plus 5-FU (control) for AK treatment. SCC and basal cell carcinoma (BCC) incidences were assessed at 1, 2, and 3 years after trial. Tissues were analyzed for calcipotriol plus 5-FU–induced T cell immunity in the skin. RESULTS. Calcipotriol plus 5-FU–induced tissue-resident memory T (Trm) cell formation in face and scalp skin associated with significantly higher erythema scores compared with control (P < 0.01). 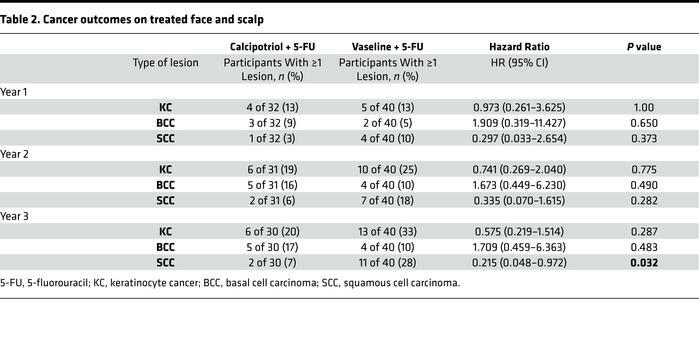 Importantly, more participants in the test cohort remained SCC-free over the more than 1,500-day follow-up period (P = 0.0765), and significantly fewer developed SCC on the treated face and scalp within 3 years (2 of 30 [7%] versus 11 of 40 [28%] in control group, hazard ratio 0.215 [95% CI: 0.048–0.972], P = 0.032). Accordingly, significantly more epidermal Trm cells persisted in the calcipotriol plus 5-FU–treated face and scalp skin compared with control (P = 0.0028). There was no significant difference in BCC incidence between the treatment groups. CONCLUSION. A short course of calcipotriol plus 5-FU treatment on the face and scalp is associated with induction of robust T cell immunity and Trm formation against AKs and significantly lowers the risk of SCC development within 3 years of treatment. FUNDING. This research was supported by internal academic funds and by grants from the Burroughs Wellcome Fund, Sidney Kimmel Foundation, Cancer Research Institute, and NIH. LAC and SD conceived and designed the clinical study. ARR, MT, and KHN performed the clinical study and related data collection. ARR, LAC, and SD interpreted the data and wrote the manuscript. ISR contributed to clinical data. MW performed the statistical analysis. We thank Barbara Gilchrest, David Fisher, Keith Flaherty, and Ethan Lerner for critically reading the manuscript. Shadmehr Demehri holds a Career Award for Medical Scientists award from the Burroughs Wellcome Fund. KHN and SD were supported by grants from the Burroughs Wellcome Fund, Sidney Kimmel Foundation, Cancer Research Institute and NIH (K08AR068619 and DP5OD021353). Conflict of interest: LAC and SD are co-inventors on a filed patent for the use of calcipotriol plus 5-fluorouracil for the treatment of precancerous skin lesions (PCT/US2015/049434). Reference information: JCI Insight. 2019;4(6):e125476. https://doi.org/10.1172/jci.insight.125476. Cakir BÖ, Adamson P, Cingi C. Epidemiology and economic burden of nonmelanoma skin cancer. Facial Plast Surg Clin North Am. 2012;20(4):419–422. Rogers HW, Weinstock MA, Feldman SR, Coldiron BM. Incidence estimate of nonmelanoma skin cancer (keratinocyte carcinomas) in the U.S. population, 2012. JAMA Dermatol. 2015;151(10):1081–1086. Eigentler TK, Leiter U, Häfner HM, Garbe C, Röcken M, Breuninger H. Survival of patients with cutaneous squamous cell carcinoma: results of a prospective cohort study. J Invest Dermatol. 2017;137(11):2309–2315. Clayman GL, et al. Mortality risk from squamous cell skin cancer. J Clin Oncol. 2005;23(4):759–765. Nehal KS, Bichakjian CK. Update on keratinocyte carcinomas. N Engl J Med. 2018;379(4):363–374. Migden MR, et al. PD-1 blockade with cemiplimab in advanced cutaneous squamous-cell carcinoma. N Engl J Med. 2018;379(4):341–351. Burton KA, Ashack KA, Khachemoune A. Cutaneous squamous cell carcinoma: a review of high-risk and metastatic disease. Am J Clin Dermatol. 2016;17(5):491–508. Lansbury L, Bath-Hextall F, Perkins W, Stanton W, Leonardi-Bee J. Interventions for non-metastatic squamous cell carcinoma of the skin: systematic review and pooled analysis of observational studies. BMJ. 2013;347:f6153. Guy GP, Machlin SR, Ekwueme DU, Yabroff KR. Prevalence and costs of skin cancer treatment in the U.S., 2002-2006 and 2007-2011. Am J Prev Med. 2015;48(2):183–187. Cohen JL. Actinic keratosis treatment as a key component of preventive strategies for nonmelanoma skin cancer. J Clin Aesthet Dermatol. 2010;3(6):39–44. Criscione VD, et al. Actinic keratoses: Natural history and risk of malignant transformation in the Veterans Affairs Topical Tretinoin Chemoprevention Trial. Cancer. 2009;115(11):2523–2530. Werner RN, Sammain A, Erdmann R, Hartmann V, Stockfleth E, Nast A. The natural history of actinic keratosis: a systematic review. Br J Dermatol. 2013;169(3):502–518. Marks R, Rennie G, Selwood TS. Malignant transformation of solar keratoses to squamous cell carcinoma. Lancet. 1988;1(8589):795–797. Gupta AK, Paquet M, Villanueva E, Brintnell W. Interventions for actinic keratoses. Cochrane Database Syst Rev. 2012;12:CD004415. Ceilley RI, Jorizzo JL. Current issues in the management of actinic keratosis. J Am Acad Dermatol. 2013;68(1 Suppl 1):S28–S38. Sotiriou E, Apalla Z, Vrani F, Lallas A, Chovarda E, Ioannides D. Photodynamic therapy vs. imiquimod 5% cream as skin cancer preventive strategies in patients with field changes: a randomized intraindividual comparison study. J Eur Acad Dermatol Venereol. 2015;29(2):325–329. Weinstock MA, et al. Chemoprevention of basal and squamous cell carcinoma with a single course of fluorouracil, 5%, cream: a randomized clinical trial. JAMA Dermatol. 2018;154(2):167–174. Cunningham TJ, et al. Randomized trial of calcipotriol combined with 5-fluorouracil for skin cancer precursor immunotherapy. J Clin Invest. 2017;127(1):106–116. Pearce DJ, Camacho F, Balkrishnan R, Fleischer AB, Feldman SR. Trends in on and off-label calcipotriene use. J Dermatolog Treat. 2006;17(5):308–313. Li M, Hener P, Zhang Z, Kato S, Metzger D, Chambon P. Topical vitamin D3 and low-calcemic analogs induce thymic stromal lymphopoietin in mouse keratinocytes and trigger an atopic dermatitis. Proc Natl Acad Sci USA. 2006;103(31):11736–11741. Sato-Deguchi E, Imafuku S, Chou B, Ishii K, Hiromatsu K, Nakayama J. Topical vitamin D3 analogues induce thymic stromal lymphopoietin and cathelicidin in psoriatic skin lesions. Br J Dermatol. 2012;167(1):77–84. Watanabe R, et al. Human skin is protected by four functionally and phenotypically discrete populations of resident and recirculating memory T cells. Sci Transl Med. 2015;7(279):279ra39. Omland SH, Nielsen PS, Gjerdrum LM, Gniadecki R. Immunosuppressive environment in basal cell carcinoma: the role of regulatory T cells. Acta Derm Venereol. 2016;96(7):917–921. Rougier A, Dupuis D, Lotte C, Roguet R, Wester RC, Maibach HI. Regional variation in percutaneous absorption in man: measurement by the stripping method. Arch Dermatol Res. 1986;278(6):465–469. Reageer op "Calcipotriol met 5-fluorouracil (5-FU) gecombineerd in een zalf is een bijzonder effectieve vorm van immuuntherapie tegen actinische keratose (AK), een voorstadium van huidkanker van het type plaveiselcelcarcinoom (SCC)"